Cable Chick is fantastic. I bought every cable I need for my new TV (7 cables including a ten meter HDMI for my projector) and the cost was lest than buying one high speed HDMI from another store. Delivery was super-fast next day. They also had every length I needed. I will be using them from now on, and also be telling everyone about them. A Multi-Adapter for connecting your Mini-DP / Thunderbolt socket computer to a HDMI or VGA screen! Compatible with MacBooks and the latest Windows 8 Slate Tablets which feature Mini DisplayPort or Apple Thunderbolt connectivity! A multi-function Mini-DisplayPort adapter cable which can adapt a Mini-DP or Apple Thunderbolt socket to connect to a VGA or HDMI Display (one at a time). Mini-DisplayPort and Thunderbolt sockets are becoming ubiquitous on modern laptops, tablets and PCs, but not all monitors, projectors and TVs share the same love affair with DisplayPort, often offering only HDMI, or the older VGA standard. In the past, connecting Mini-DisplayPort devices to VGA or HDMI displays required a separate cable for each occasion, but with this handy travel-sized adapter, you can plug in just about any standard display using the cable it already has. 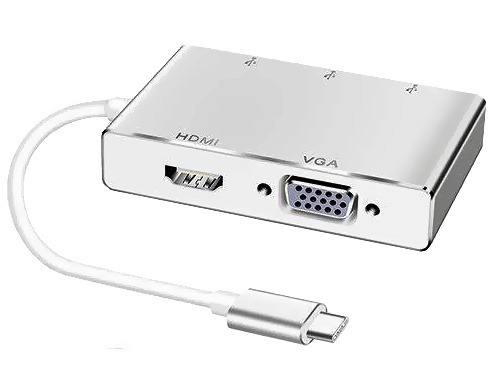 Choose between either HDMI or VGA (this is not a splitter or MST hub) and connect a single display to any DisplayPort-compatible Thunderbolt socket, or a standard Mini-DisplayPort socket on any PC or Mac based device and enjoy immediate conversion to HDMI or VGA. Just plug in any regular HDMI or VGA cable (like the one already attached to your display) and it'll be good to go for resolutions up to 1920x1080 Full HD. Just check that your Mini-DisplayPort source has support for HDMI and VGA compatible video output - read your device manual or look for the D++ symbol to know if your source is compatible with this type of adapter cable. This adapter is not bi-directional, and does not convert HDMI/VGA devices to work on Mini-DisplayPort screens. Also compatible with PCs with D++ Mini-DisplayPort outputs from Intel, ATI and nVIDIA. Plug and Play. The best way to connect HD monitors, HDTVs, projectors, or other display devices to your computer or tablet. Designed for connecting a Mini Display Port Device for use with a HDMI or VGA enabled TV, projector or monitor. DisplayPort (DP) adapters are not bi-directional, and require a DP output which is DP++ (Dual Mode) compatible. When a DisplayPort to HDMI adapter is connected to a DP++ (Dual-Mode) output, the output device senses the presence of the adaptor/cable and sends HDMI signals over the DisplayPort connector rather than DisplayPort signals. No signal conversion is performed by the adapter. HDMI signals are merely passed through. Please note: Whilst the Adaptor can output to HDMI Audio support is dependant on the capability of the source Mini-DisplayPort device. I have a 2015 iMac. that I use with this computer measures 7 x 4 mm. What are the measurements of Thunderbolt plug end of this adapter? This adapter has a standard Thunderbolt-compatible Mini-DisplayPort plug." Does this connector actually suit a 2009 white unibody Macbook a1181 model ? I need a HDMI converter to output from my macbook. Answer: "No. The White-09 spec Macbook is more likely to sport a Mini-DVI socket than the newer Mini-DisplayPort/Thunderbolt socket. You can match the port on your laptop with our connector chart here: http://www.cablechick.com.au/content/cable-connector-chart/#dvi , and I'm fairly sure you'll need the following adapter: http://www.cablechick.com.au/cables/mini-dvi-male-to-hdmi-female-adaptor.html"
The order arrived very promptly and I was thoroughly satisfied with the product, its construction and performance.